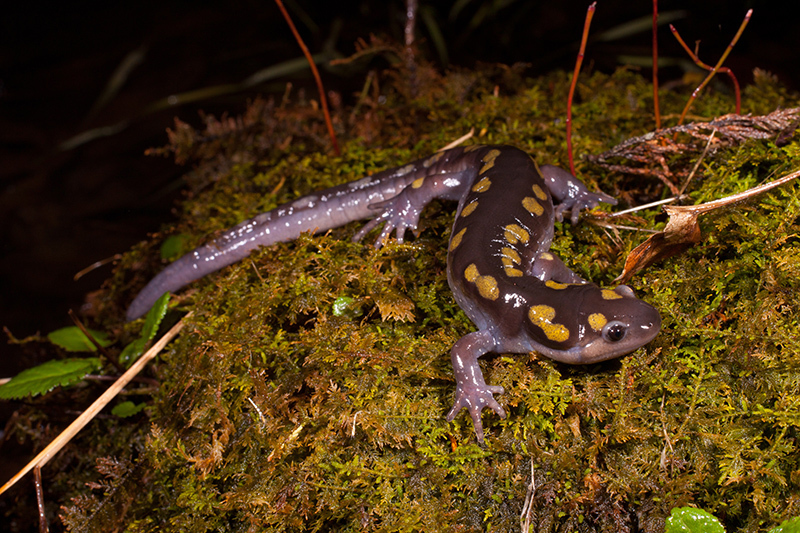 The Spotted Salamander (Ambystoma maculatum) is a common species of mole salamander. Photo credit: T. Travis Brown. I have been asked some variation of this question multiple times over the past several years. Sometimes the “hellbender” is found in a barn, on a basement floor, crawling across a driveway, or occasionally in a pond. The common denominator is always that someone has found a salamander, and they are concerned it is an Eastern Hellbender that needs help. Top: Hellbender, Bottom: Common Mudpuppy. 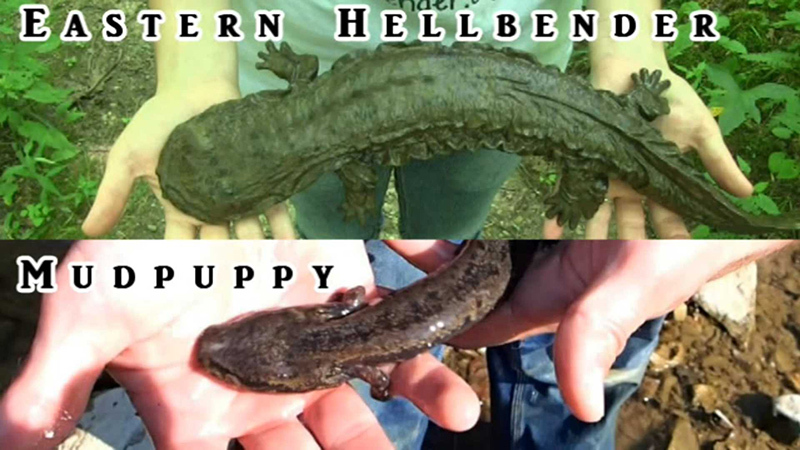 So if you haven’t found a Hellbender, what have you found? 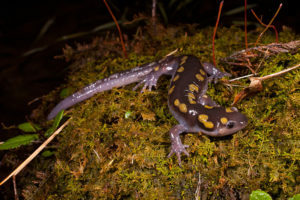 If you found your salamander on land, it is very likely one of a group of salamanders known as mole salamanders. Mole salamanders are common throughout most of Indiana. They typically breed in ponds in the spring and then hide under logs or bury themselves underground. They are commonly found during spring breeding migrations and are frequently seen in large numbers. They often times find themselves wandering onto our properties and getting stuck in window wells or hiding themselves under rocks, firewood, or in our barns. If you found your salamander in the water then it could be either the aforementioned mole salamander or a Common Mudpuppy. Mudpuppies are commonly confused with hellbenders and do live in ponds, wetlands, and creeks. Like the Hellbender, they are fully aquatic and don’t go on land except in very rare circumstances. Mudpuppies have large, fluffy gills behind their heads, which Hellbenders do not have. Mudpuppies also lack the skins folds along the sides of their bodies.